Our goal as shooters and self-defenders is to get the very best target hits we can with our gun, its ammo, and its sights. Whether we are defending our lives, competing in events, defending our home, or just having fun plinking, we want our point of impact for our bullets to match our point of aim. That is our goal, and it naturally depends primarily on our skills and training and the type of handgun and ammo we use. But, it also depends on the sights on our gun and how they are adjusted, zeroed, and used. Wouldn’t it be nice for all handguns, if a shooter’s point of aim would automatically equal point of impact? Well, sadly this does not regularly happen when the guns and their sights come from a manufacturer. Often they must be adjusted and matched to our preferences and style to get the job done. And my experience tells me that it does not happen all the time when a quality handgun first arrives from the manufacturer. The handgun itself and how it is built, adjusted, and equipped have a lot to do with shooting point of aim to get a matching point of impact target hit. Understand that handguns are designed and constructed by manufacturers, so each handgun has a specific built-in sight picture. How do you handle this factory matching of a certain sight picture and zeroing to get the very best hits and not sporadic, scattered all-over-the target hits? What is the Role of Sight Picture? Sight picture has a lot to do with the goal of your point of impact matching your point of aim. Simply, a sight picture is the placement of a gun’s sights on the target at different distances, to let you know where your shots will impact. It is a “zeroing” or “hold” for the sights, so the shooter will know where to drift (or replace) them to change the point of impact. Note on some guns this is not simple or effortless since the sights are milled into the top of the slide or adjustment is not very easy for the fixed sights. Sight picture is a superimposing or applying of the aligned sights onto the target. Sight pictures are different for different guns. If a manufacturer has zeroed your handgun to match a center-mass sight picture or hold and you use a 6 o’clock sight picture, your target hits will be very different. Of course, you can change your sights and some adjustment can be made. But, knowing the sight picture of your specific gun is critical for accuracy. See my June 4, 2013 article “Proper Sight Alignment and the Keys to Accuracy” here about this. I have found that many semi-automatic pistol and revolver manufacturers zero their handguns to correspond to a 6 o’clock sight picture, which often causes the impact of the round to hit higher than where the handgun is actually aimed. I prefer the center-mass sight picture because my eyes have a tendency to move around much less to place the sights on the center of the target quicker. What is the Difference Between Sight Alignment and Sight Picture? Sight alignment or aligning the front and rear sights (with proper horizontal and vertical alignment), having a precise sight picture and maintaining that sight picture while pressing the trigger for the shot are BOTH critical for accuracy. But, sight alignment of your front and rear sights is different from placing the aligned sights on the target or sight picture. For proper sight alignment, the front sight must be in the middle of the rear sights with equal white space on either side of the front sight blade. This is vertical sight alignment. Also, the top of the front sight must be level with the top of the rear sight for effective sight alignment. This is horizontal sight alignment. Both horizontal and vertical sight alignment should occur for the absolute best target hits. So, BOTH are necessary for successfully AIMING your handgun. And, sight alignment and sight picture are different, and BOTH are important in aiming. After your front and rear sights are properly aligned and adjusted if your handgun shoots to the point of aim, and if you can press the trigger without disturbing the sight picture, you will almost always hit the intended target someplace every time. Now that is easier said than done for most, especially if you are stressed and under attack by someone using deadly force. It may be necessary to adjust the sights on your gun to have the point of impact equal point of aim. Tip: The General Rule for Changing the Point of Impact Is to Move the Rear Sight in the Same Direction You Wish to Move the Point of Impact. To move your point of impact right, you need to drift the rear sight to the right. Make an adjustment in the windage (side-to-side horizontal.) Conversely, to move your point of impact to the left, you must drift the rear sight to the left. Also, for elevation (up-and-down-vertical), the higher the REAR sight, the higher the point of impact. You can make the adjustment with a sight adjustment tool or just use a padded vise and a brass punch and hammer. Hopefully, your adjustable sights are marked with “Up” or “U” for Elevation and either a “L” or “R” for Windage with a directional arrow to let you know the direction to turn them. But, some do not have these. Note the FRONT sight moves in the opposite direction. Usually, you turn the screw for the rear sight counter clockwise to raise elevation, but this varies. Tip: If Your Hits Are Impacting Low, Mechanically Adjust or Raise the Rear Sight Elevation to Get Higher Hits With a Higher Point of Impact. This above lowers the FRONT sight. And remember this is different than the requirement for proper sight alignment. If you have a removable front sight (screwed, pinned, or dove-tailed) and your hits are LOW, you can consider replacing your front sight with a LOWER front sight. Do you Focus on the Front Sight or the Target When the Trigger is Pressed? 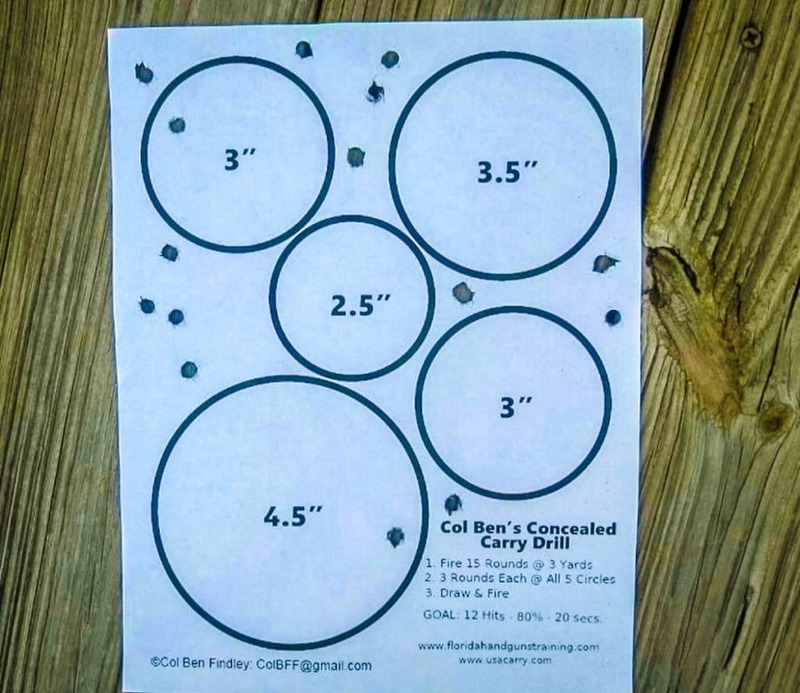 By default, if you are focusing more on the “bad guy/gal” target, then you are not primarily focused on the front sight of your handgun and the sight picture. For me and my optimal accuracy, I must keep telling myself and practicing that I should be focused intently on the FRONT SIGHT at the time I press the trigger. Tip: The Shooter Should Be Focused Only on the Front Sight, and Not on the Target and the Rear Sight When the Trigger is Pressed. Thus, both the target and rear sight will be blurred, as they should be. CAUTION: Do NOT do this in a deadly-force encounter or for personal protection if you have not thoroughly and frequently PRACTICED this. You are likely not to hit your intended target and possibly get killed or seriously injured. Safety First Always! Intently focusing is a necessary handgun skill that is learned from repeated practice, just like proper trigger press. Earlier, I did NOT genuinely understand these words “Focus on the front sight,” although I heard them many times. So, I wonder how many shooters actually do “intently focus” ONLY on the front sight when pressing the trigger… and NOT on the target and rear sight? On some of my handguns’ sights, I put a small mark on the very top-middle of my front sight blade or post. It helps me and forces me to look for just ONE SPOT or point at the very top of the sights on all my guns. I want to develop that muscle memory. Our eyes tend to move some naturally. So by focusing on just one spot on your front sight, your eyes will not follow the tendency to move off or away from the location and the front sight. Swiss physician and philosopher I. Paul Troxler made an important visual effect discovery in 1804, and it has become known as the “Troxler Effect.” It is often applied to shooting fundamentals and visual fields when aiming a firearm. He discovered that rigidly fixating one’s gaze (intent focus) on some element (e.g., front sight) in the visual field can cause surrounding stationary images to slowly disappear or fade from attention and help reduce the effects of extraneous (background-secondary) movement. Of course, this is very important for aiming a handgun. Try this Troxler exercise at home with the above image to help you genuinely and intently FOCUS on the front sight. Then, after you master this static exercise, PRACTICE concentrating for yourself by dynamically practicing it in a safe setting at the range with an unloaded gun, by intently focusing for 20 seconds or so on ONLY the front sight. SAFETY FIRST! Tip: Really Concentrate and Keenly and Arduously F-O-C-U-S on the Front Sight Without Blinking. Try not to blink so much and momentarily let your eyes move aside. If you do, the dots will reappear. Try again without blinking and really focus. Generally, the closer you are to the sight, the easier it is to focus on the front sight dot, so practice and concentrate quite a bit for long-distances. However, the distance between your eyes and your front sight should be about the same with different handguns. I hope you experience the “AH HA!” moment I did when I first experienced this genuine focus since it dramatically changed my shooting technique and concentration forever to achieve POI = POA. Certainly, there are hardware and software considerations for the POI = POA goal. Of course, reviewing and practicing the fundamentals of grip, trigger control, sight alignment, sight picture, and follow through compose an important first step. A “software” focus. Another consideration to help could be a “hardware” issue with the physical gun itself and how well it digests the various ammo. Before we put attention on the gun itself and problems with its physical dimensions, specifications, features, and adjustments, let’s assume you took the time to setup your criteria for selecting the handgun, matched your choice of gun to them, and actually had hands-on for 500 rounds or so to determine the suitability of the gun for your use. After that, I like to start with the ammo issue and switch ammo to see how that affects my POI = POA. Tip: I Check or Change My Ammo First Before Adjusting Sights or Changing Them. So, maybe not meeting your POI =POA goal is a hardware ammo issue, if you are not hitting with your quality gun that meets your criteria. I have frequently found that AMMO is indeed the problem… or I am not locking my wrist or griping the gun very tightly, etc. It may be necessary to go back and retry the gun with different ammo to check its performance. Since you are not hitting where you are aiming and hitting high or low on the target, a good first solution is to try a variety of ammo… different brands, weights, and types (Full Metal Jacket and Jacketed Hollow Point.) I know a lot of guns are finicky about ammo and one brand, weight, or type may behave differently in one compared to another. Don’t be a pusillanimous coward and do fork over the bucks up front to try various ammo first. Some guns prefer Jacketed Hollow Points (or one particular brand of it), while others easily jam or malfunction with it. Also, short-barreled handguns shooting heavier-grain bullets may impact higher on a target vs. lighter-grain bullets hitting lower. But, this varies considerably. But ammo is an option to check, before costly adjustments or new sights, etc. Photos by Author & as credited. © 2018 Col Benjamin Findley. All Rights Reserved. This article may not be reprinted or reproduced in whole or in part by mechanical means, photocopying, electronic reproduction, scanning, or any other means without prior written permission. For copyright information, contact Col Ben Findley at [email protected].